Maybe you heard about it from a community radio station or read about it in your local paper? Maybe you happened to see Jerral at a psych conference or a library reading, or on television or a radio talk show? Or maybe you just stumbled upon THE HAND BEHIND THE WORD on your local bookseller's shelf? 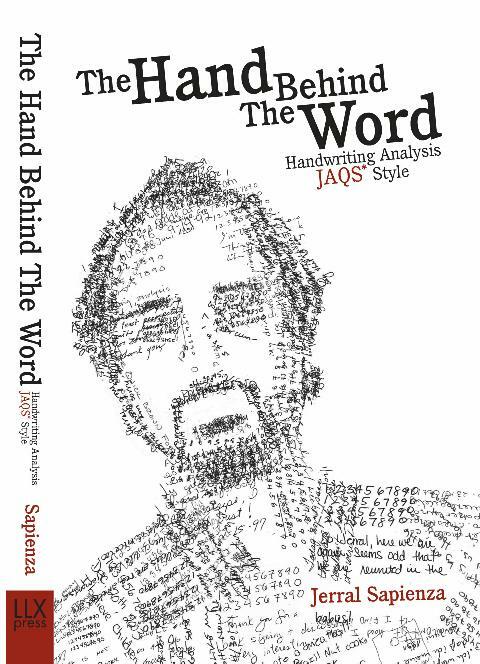 Whatever the source, you'll surely agree: THE HAND BEHIND THE WORD is an engaging new narrative view of Handwriting Analysis for beginners and experts alike. And it's definitely not your Aunt Margie's book on handwriting! It is an accessible and engaging book, almost like a self-help reality novel, teasing and teaching readers to a path of better understanding as they take a look at something they've taken for granted all these years. When you sit down with a copy of THE HAND BEHIND THE WORD it's like embarking on an interesting journey with a friend and tour guide looking into your everyday world, yet seeing things you've never seen before. You get the distinct impression that you've been missing something in all that handwriting you've been seeing go by all these years. You'll never look at your own or anyone else's handwriting the same way again. If you're hearing Jerral on the radio for a live show and want to submit your handwriting for analysis for inclusion in the show, click here for more info about the sample format before writing your sample. Education  Public Relations . . .
Amidst tidbits about some little known facts about the history and mechanics of handwriting, you take a tour of cultural and personal variations. Friendly and fascinating, THE HAND BEHIND THE WORD encourages you to learn, grow and share while mastering an enjoyable new skill. An informative and engaging guide to learning more about handwriting and its subtle meanings in business, public relations, relationship and life in general, the book also introduces the unique JAQS (Just A Quick Sample) Style Handwriting Sample format, which consists of Four Rows of Digits, a Signature, Printed Name, Paragraph of Choice and the Date. From this fairly small sample, an entire world of personality emerges. Our books are available all across the US (and in several foreign countries) in bookstores everywhere, online through BN.com, Amazon.com or your favorite bookstore portal. Or if you can't find a book in your area now, you can always order direct from us here at HandBehindTheWord.com, too. We're busily taking inquiries and orders from hundreds of curious new readers like you every week. Handwriting is far less common today than it was fifty years ago, and yet it is no less powerful a reflector of our personality and values. Accessible, inexpensive, portable across time, culture and miles, it can be a very simple way to observe our commitment to personal growth as we take samples of our own handwriting over time. How might you consider making practical use of handwriting? 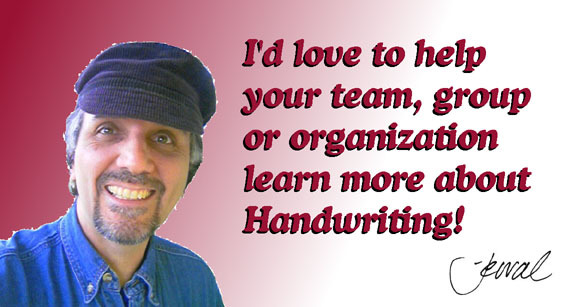 If you're a team lead, counselor or a people manager, a better informed view of handwriting can improve your understanding of how you and the people around you interact and relate. Handwriting is a fascinating reflector of our personality, flowing and changing with the activity and emotions of our lives. It's always in flux, recording and reflecting, shifting and becoming a mirror of our lives. You can't change your Life without changing your Handwriting"
If you are a member of a Reading Group, Study Group or Book Club you may wish to consider forming a special interest group (SIG) in your area to study handwriting analysis. THE HAND BEHIND THE WORD makes a perfect group study book for kickstarting the learning process with a useful new lifelong interest and skill. Useful as an interactive hands-on guide to learning about handwriting, THE HAND BEHIND THE WORD is chock full of examples and discussion about various hands and writers, including a special series of tables in the center of the book focusing on the digits in handwriting. Look up your own or anyone else's way of writing numbers for a bit of immediate reflection on their meaning. To make best use of Handwriting Analysis for lifelong learning as a practical research tool, you'll want to pick up a copy of the companion volume, JAQS HANDWRITING SAMPLES COLLECTION BOOKLET (ISBN 0971710767). 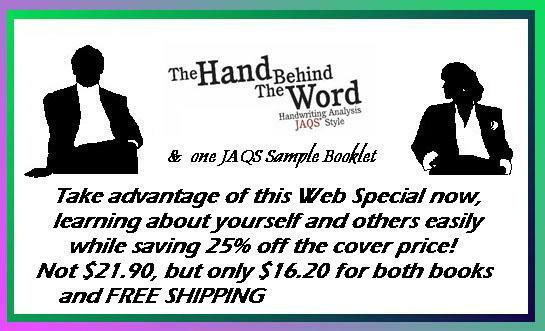 These handy little booklets are 48-page JAQS formatted blank books designed to collect individual JAQS Style Handwriting Samples for a general reference and for deepening a study of handwriting analysis. "Developing an eye to see is the first step to decoding the mystery." Often available to consult on marketing and PR projects, teambuilding retreats, employee screening trainings, dating service / matchmaking profiles for online services, HR & T in-house events and other select projects and events. Be in touch with your requirements today. Have you yet read the book? If so, consider visiting Amazon.com or Barnes & Noble or other online review sites and letting the world know what you think. You can also click on the " Reviews" button here and write one for publication here on LLX.COM Get the Book. &nsbp; Take some samples. See what you can learn. One thing is certain: after spending a few minutes with this book, you'll be keeping a better eye on your own handwriting and that of everyone around you with a new fascination and a knowing smile. You're sure to enjoy the adventure and discovery of the HAND BEHIND THE WORD. contact your local bookseller or Amazon.com or visit the LLX Press Book Order Page. Jerral is also author of the End-of-Life Caregiving classic, URGENT WHISPERS: Care of the Dying used in hospice, caregiving, nursing and medical education programs across the US and several other countries. URGENT WHISPERS draws on quite a different subject matter, but as Jerral says, "They're both about paying attention to details and calling upon what's hidden there behind the veil of the obvious." © 1994-2019 by Lifelong Learning Excellence, Inc.